When the chants rise up, Gigi or Gargi Tamang finds that she has to gravitate to the strange object that they seem to emanate from a disc made of a metal that no one can identify. Could the myths that we’ve heard from time immemorial, actually be true? Yaduvir and Gargi Tamang, twins are nothing like each other; he, a mild-mannered and scholarly youth, and she, a feisty young woman, full of energy. A telephone call from India suddenly changes their lives. They find that they are the designated guardians and protectors of a strange shield that is both co-vetted and feared by their own clansmen. They are completely unprepared for the adventure they are rocked into, where no one around them seem to be who they are, where they are constantly on the sun and where they have been summoned for a task they cant even accept as true. Ritu Lalit spent the first few years of her life in the north east of India, where she would lie on the grass and stare at the skies, convinced that she did not belong to this planet. Since she was here, she tried her utmost to fit in, even learn math! But the desire to live in a dream world could not be suppressed, so now she writes fiction. In real life she lives in the NCR (National Capital Region) with her two sons, a daughter-in-law, three dogs and 20 fishes. 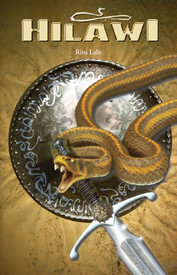 Hilawi, ventures into a genre of mythological fantasy and suspense, which Ritu Lalit has penned down with aplomb. An enthralling tale of intrigue and suspense with the interwound mythological fantasy with present day penned down in beautiful words. Fantasy, One of the most popular genres, also, One of the most difficult genres to write on with, The author with her strong and crisp writing has blended mythology with an entirely new tale that is set in the modern times which intertwines between the past and the present in a beautifully way. The plot changes with a blink of an eye with its twists and turns, which you may feel as a roller-coaster ride. It totally engrosses the reader and one has to wear his / her thinking cap while reading the book. Its fast paced which keeps you engaged with the book, this might be a turn off for some readers, but at the same time it adds up the points of the book. A Recommended book by Books Review Forum.